Road Safety Social Media | Is it worth the risk? It seems like a lifetime ago that almost every other person I knew owned a Nokia 3310. I couldn’t walk a few steps without hearing the “Kick” ringtone and my friends and I could pass hours of the day feeding our addition to Snake (and later Snake II!). The phones themselves seemed so advanced at the time even though the one of the coolest features was having interchangeable facias to personalise your device. Fast forward to 2015 and the face of the mobile phone industry isn’t an interchangeable plastic cover. It is the ability to take HD photographs and video, make video calls, play music, stream movies, surf the internet and browse the app stores for apps that are “guaranteed” to improve our quality of life. What on earth is Periscope? To many of us a periscope is a cleverly d designed optical device to see round bends and corners. However, Twitter has decided to adopt the name for their new live video streaming app. It essentially allows users to broadcast from their device, wherever they may be such as in the comfort of their own home, on a beach in a sunny destination or more worryingly from their car. Periscope’s live feeds can be captured using iPhones or iPads but watched through smartphones, desktops or laptops either through the app or on Twitter’s site. A very sophisticated app but yet another temptation for someone to be on their phone broadcasting to an audience. Mobile telephones are now so powerful we can organise our entire lives from our sofa and they undoubtedly promote a life of convenience. . There is no need to go to supermarkets or the high street as we can purchase anything we could possibly imagine from the internet via our phone. Face-to-face conversations and even voice conversations have taken a back seat to texting/Whatsapping/Kiking/iMessaging. Keeping in touch with distant relatives is now no more than a Skype or Facetime away. If we’re really lazy and don’t want to stretch for the TV remote, we can even download an app that can do the job for us (control the TV, not reach for the remote….at least not yet). The last decade or so has also seen the rise and dominance of social media and I would not be surprised if there were thousands of people who spend more time on social media sites than they do in school or at work. There are those of us who wake up and check Facebook before turning off our alarm and those that end every day with a goodnight Tweet to their followers. We are well and truly in an age where many people (myself included) would sooner take their mobile telephone to a desert island than anything else. With the huge range of dazzling options available to us in the palms of our hands, mobile phones have never been more difficult to put down. Unfortunately, this proves true to some even whilst driving. Using a mobile telephone whilst driving may only divert your attention from the road for a moment but the consequences from that brief moment can be catastrophic. It has been an offence to drive whilst using a mobile phone since December 2003 but despite the warnings and TV campaigns there are those who simply cannot resist the temptation of their phone and the number of motorists charged with this offence has only increased. In 2015, we don’t just have motorists checking texts; we now have motorists reading emails, uploading pictures to Instagram, Tweeting about road rage and (most recently) “Periscoping”. Periscope is the latest must-have app to hit smart phones. It allows anyone to broadcast live from anywhere – and I mean anywhere – using their phone. There is no need for a WiFi connection and a webcam instead, you tap your phone and you are immediately transmitting to anyone who chooses to follow you. After playing about on Periscope myself for a few minutes, I was genuinely astounded by the amount of people “Periscoping” whilst driving. Literally sat in their car driving around whilst talking to broadcasting to their followers. As mentioned above the penalty for using your mobile whilst driving (regardless of what you’re doing) is relatively minor but there are probably a few points to consider that you may not be aware of. If you are on nine penalty points (possibly built up from 3 separate mobile phone offences) then one more transgression will make you a Totter and you could be facing 6 months off the road. Would checking your Facebook have been worth it? How about if you’re driving along using your mobile phone and you suddenly drive into the back of someone. Not only could you be charged with mobile phone offence but you will likely face charges of Careless Driving and face up to 9 penalty points or a disqualification. Would Tweeting about what you’re going to have for tea that evening have been worth it? The scariest instance would be that you’re driving along on your way to work when your phone beeps on the passenger seat and it’s a text from your significant other! You reach across because you simply cannot wait to see what they have to say and in that brief moment that your concentration is on your phone instead of the road, you pass through a red light directly into traffic and kill the driver of the other vehicle. You are now facing a charge of Death by Careless or Dangerous Driving and could be facing time in prison. Would checking that text message really have been worth it? I am without a doubt a bit of a geek and technology lover. I take my phone everywhere and am guilty of over using social media. It is so easy to assume that you’re safe to take your eyes off the road for a second but there is no driver on earth who knows for sure what is coming. You might check your phone regularly whilst driving and not have had any consequences whatsoever. But do not let this fool you into a sense of security. There is no driver on Earth who knows for sure what is around the next corner and all it takes is one tragic occasion to ruin lives, your own included. Technology that could make a difference and our roads safer? 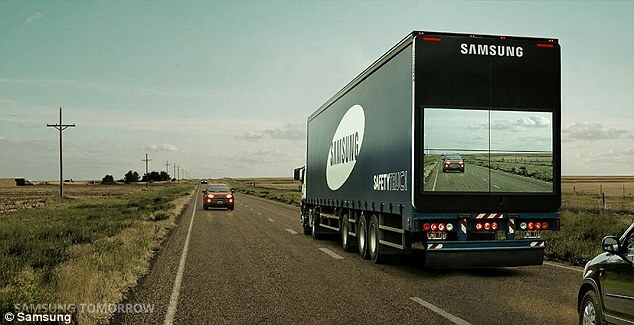 Samsung is looking to utilise technology that will potentially save the lives of drivers who get impatient when they are stuck behind semi-trailer trucks on single-lane highways or roads.